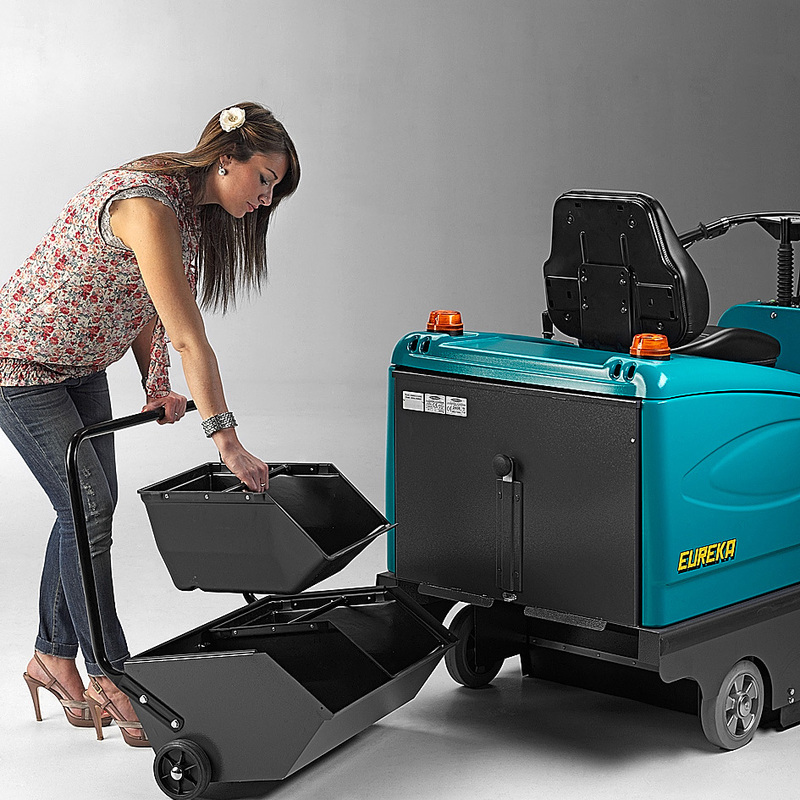 An efficient ride-on vacuum sweeper designed and manufactured by Eureka in order to sweep small, medium and large areas. 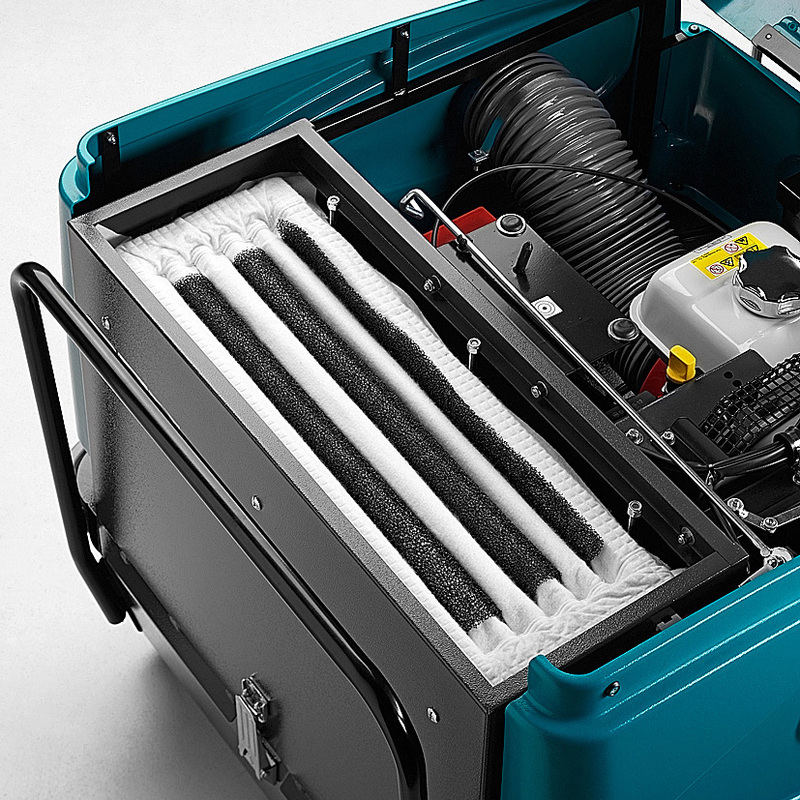 The Tigra is compact, user-friendly and provides an excellent filtration rate (99,9%). 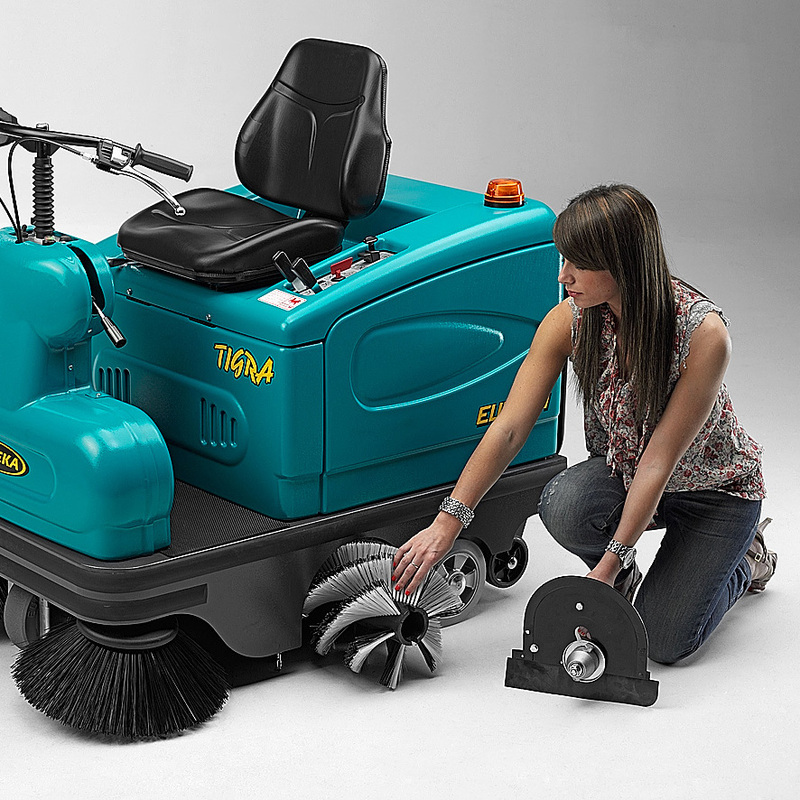 WHICH MODELS ARE AVAILABLE FOR THE TIGRA SWEEPER? 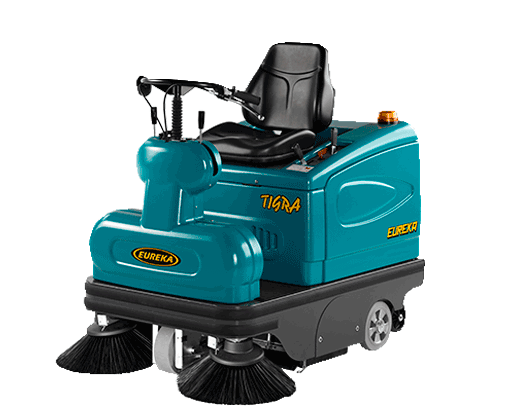 The battery powered Tigra EB is particularly designed for the cleaning of narrow indoor areas, as well as large carpeted areas. WHY IS TIGRA SWEEPER ROBUST & RELIABLE? The Tigra sweeper structure is entirely manufactured in Eureka S.p.A, in order to ensure the highest qualitative standards. The durable steel frame is coated with anti-corrosion paint and all tanks are made of special robust anti-shock ABS plastics. The Tigra is equipped with a PVC bumper and three antiwear tires. The side brushes are set up on special anti-shock supports. HOW OFTEN SHOULD I CHANGE AND CLEAN THE FILTER? The polyester bag filter (class L) requires minimal maintenance, it can be cleaned thanks to an efficient mechanical shaker; moreover differently from paper filter, it is easily washable, more resistant and reusable. WHY IS THE TIGRA SWEEPER SAFE TO USE & RELIABLE? 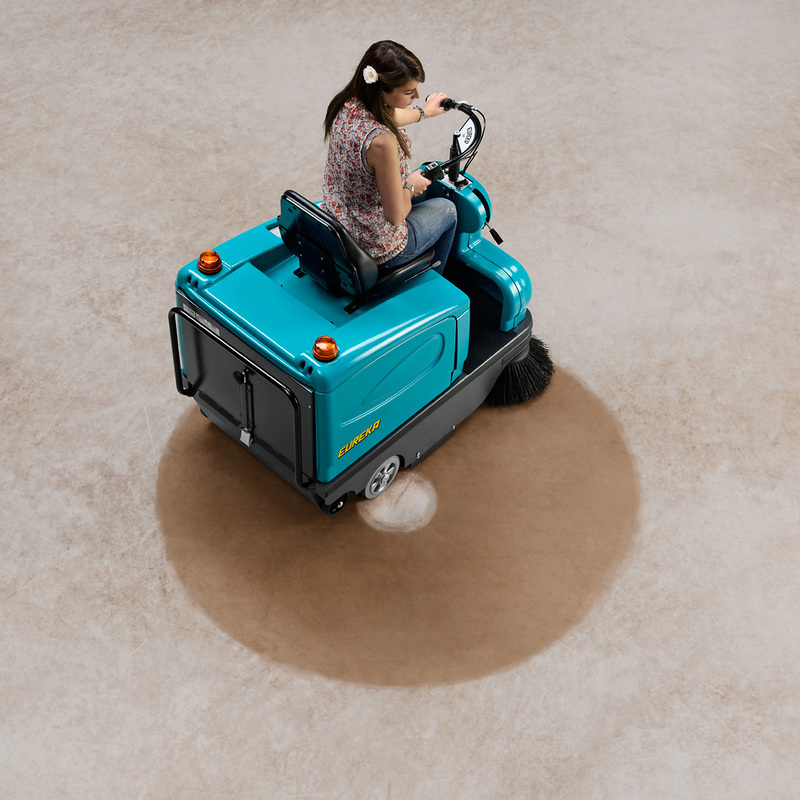 The Tigra ride-on sweeper offers the standard Eureka S.p.A. security features such as: electric brake, mechanical parking brake, front and rear lights, reverse sound, main brush locking system, claxon and warning light. The visibility is excellent, all controls are intuitive and ergonomic in order to facilitate cleaning, maintenance, and proper operation. CAN I SWEEP CARPETS AND MOQUETTES WITH TIGRA? Yes, Tigra is eventually equipped with a special carpet & moquette kit, which is specifically designed for those surfaces. In addition the full-rubber non marking tyres protect even the most delicate carpet. HOW TO ADJUST THE CENTRAL BRUSH? The central brush is suspended on floating mounts so that it adjusts automatically to compensate for uneven surfaces and wear. TIGRA - COMBINES THE MANEUVERABILITY AND USER-FRIENDLINESS OF A WALK-BEHIND SWEEPER WITH THE EFFICIENCY OF A RIDE-ON. Thanks to its size, Tigra is particularly suitable for the cleaning of indoor hard surfaces as well as large carpeted areas. Fine dust is filtered through a polyester bag filter (class L), which allows for an excellent filtration rate (99,9%) and it has a much longer lasting life than traditional filters. The filter can be cleaned thanks to an efficient mechanical shaker. Maintenance access is convenient, the top lifts up to expose the battery compartment as well as motors and other service areas. The compactness of the machine with its small turning radius (950 mm), makes it particularly suitable for sweeping in narrow confined areas, not accessible by larger machines. The standard right side brush is activated from the control panel. A second (left) side brush is available as an option. Both brushes are mounted on side shock-absorbers to prevent damage. Thanks to the position of the hopper, the Tigra offers better visibility and filling capacity. The debris container has a real capacity of 83 kg and is on wheels. It also has a convenient transport handle that allows the entire hopper to be rolled to the emptying site. 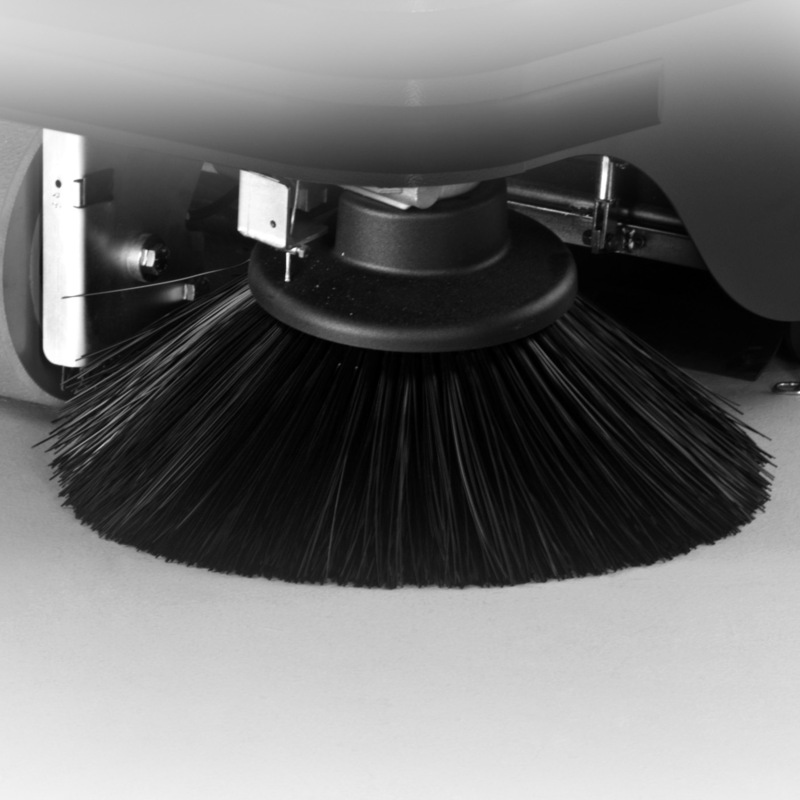 The brush is suspended on floating mounts so that it adjusts automatically to compensate for wear and uneven surfaces. An innovative locking system enables the main brush to be replaced without tools. Fine dust is filtered through a polyester bag filter (class L), which allows for an excellent filteration rate (99,9%) and it has a much longer lasting life than traditional filters. The filter can be cleaned thanks to an efficient mechanical shaker. 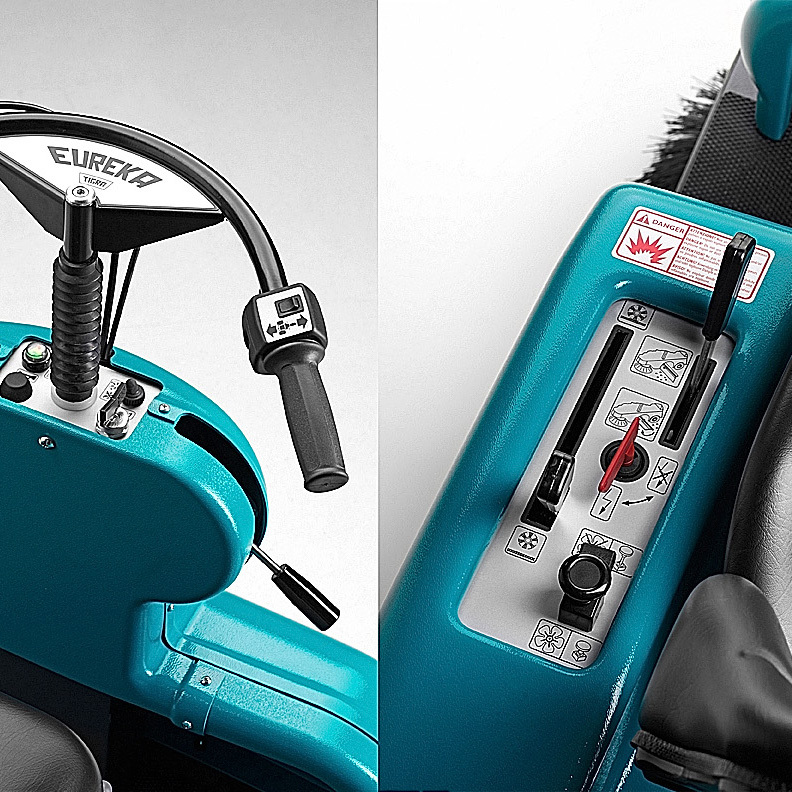 Visibility is excellent from the operator’s position, and all controls are simple and ergonomically located for easy operation. Improved resistance against impact and ageing. Impressive reduction in costs associated with maintenance. Additional safety for operators. Ideal machine for rental.